Please contact us for quotes on larger quantities. A black material composed of nanoscale titanium particles ranging from 10s to 100s of nanometers in diameter, titanium nanoparticles have seen widespread use across a diverse selection of industries. Available as spherical or faceted forms, various purities, coated, and more configurations, titanium nanoparticles offer some of the most exciting possibilities in nanoparticle engineering and research. UV radiation resistance. Due to natural UV radiation resistance, titanium nanoparticles see usage in an extremely broad array of applications. Intense research to identify the mechanism by which titanium works as protection against ultraviolet light continues, with a few promising results already discovered. Odor elimination. Titanium nanoparticles have seen usage in various odor elimination applications, neutralizing smells such as formaldehyde. The antimicrobial properties of titanium nanopowder also contributes to elimination and prevention of odors, making it a very popular additive for textile coatings and similar applications. Aerospace materials. Due to its UV resistance, low friction, wear resistance, general strength, and other properties, titanium nanopowder serves as a highly valuable material in the production of aerospace materials. Biocompatible materials. Certain configurations of titanium nanoparticles present impressively high biocompatibility, making it a source of intense research for applications including implant manufacturing, drug delivery, bioimaging, and other medical science. 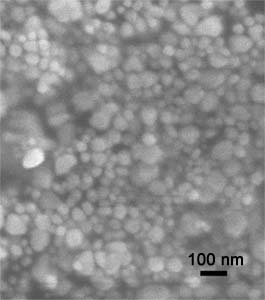 Metal-oxide nanocomposites. As part of a nanocomposite, titanium nanoparticles provide increased radiation resistance and durability. Microsensors. The unique properties of titanium nanoparticles make them ideal for the production of various microsensors, including oxygen sensors, humidity sensors, and many other nanotechnological microsensors. Optical filters. Titanium nanoparticles as part of stable dispersion show great potential for optical filters and other related technologies.